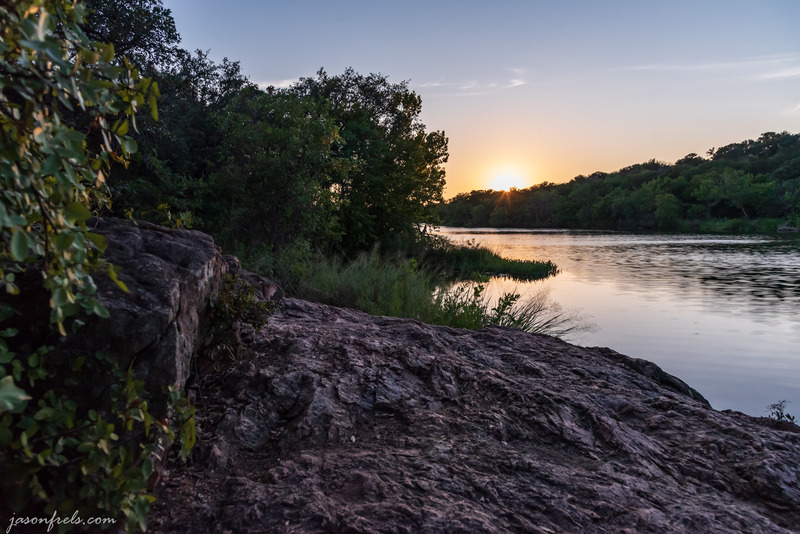 I wandered around Inks Lake State Park after work on Friday trying to see if I could find a good viewpoint for some sunset photos. 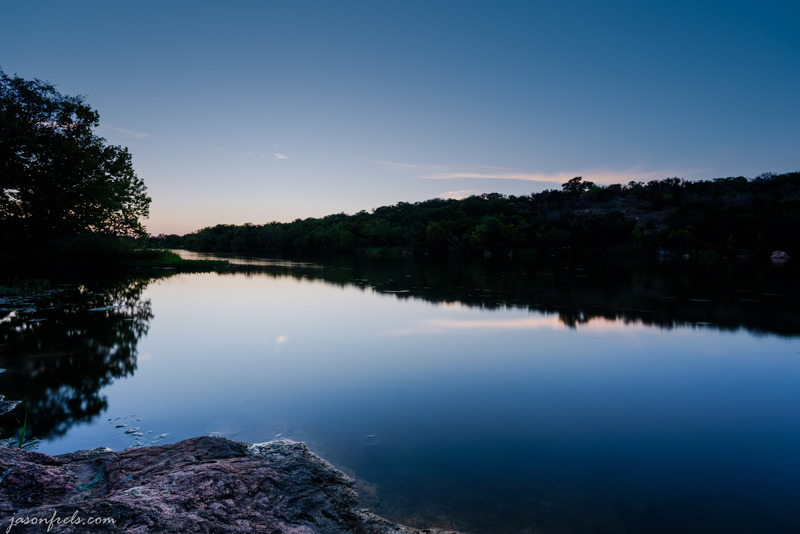 Inks Lake is the closest State Park to my house and I go there quite a bit for hiking and photography. Many of the hiking areas were closed for some reason so I headed down to the other end of the park to walk around. The park is usually crowded with people having fun and I have to try to shoot around them, which I don’t really mind. I ended up wandering around the through the weeds a bit and found a spider, but thankfully no snakes. 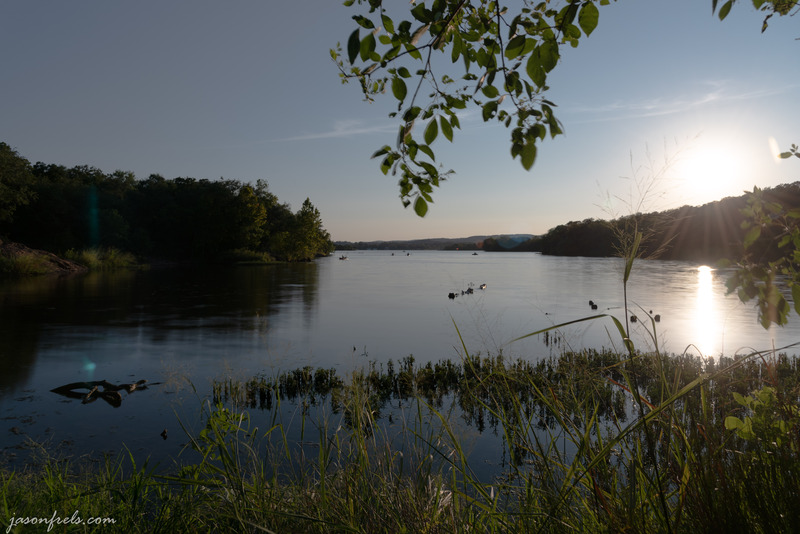 My first attempt was getting to the lakes edge through some tall weeds as I wanted to get a tree branch across the water in the direction of the sunset. You can see the branch in the in the photo below as well as a lot of kayakers in the distance. I didn’t think that the log in the water was working for me with any focal length. I was also getting a lot of lens flare from this perspective. I really couldn’t get around much in this area to reframe my shot, so I got out of the weeds to go find another place. I eventually decided on an area of granite next to the lake. There was a bit of a step that I tried to frame closely by getting my camera down low to the ground. I thought that the rocks in the foreground might provide a nice pattern and I got the sun just as it was sinking below the trees in the distance. See the photo below. For some reason I really had the ISO set high in the above photo (probably for focusing through the filter), though there is not much noise except where I have boosted some shadows a bit. 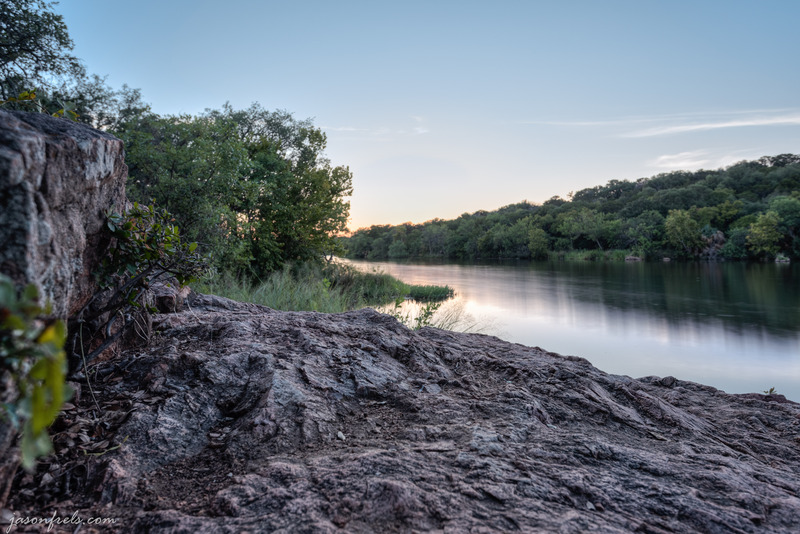 This is part of Inks Lake, but it looks more like a river in this photo. I did get a lot of nice color from the sun and I particularly like the bit of flare that I got of the sunlight getting past the trees on the horizon. The next photo is a merge taken a few minutes later. I wanted to see what HDR would do for the rocks in the foreground. I got more detail, but I like the single exposure better in this instance. Later when the sun was truly down and the sky turned deep blue, I moved the tripod up close to the water’s edge and attempted to get all of the blue reflected in the lake. This might be my favorite photo of the night. I like the way the triangular shape of the land and its reflection divide the image and provide some symmetry and lines. I wish the temperature would have been as cool as the picture looks; it was still very hot out there. The above is an HDR merge of long exposure photos. There was still a lot of contrast on the horizon and I wanted the foreground granite to expose well, so I took multiple exposures. The lake is really shallow in this area and filled with little boulders. I have kayaked through here several times and end up rubbing a lot of rocks. You could wade across to the other side, but you would probably like to have some water shoes on for the sharp rocks. I was kind of disappointed in the lack of clouds, but the blue hour sky turned one nicely I think. Such calm water in the last photo. It reflected the land so nicely. I also love the blues of that picture. The last photo had some really long exposures in the merge to smooth out the water and get the clean reflection.